Nearly 20 years ago I inherited my mother's costume jewelry collection, most of it already vintage by then since she'd had many of the pieces for most of her life. She was a bit of a note-writer, attaching handwritten messages to some of the pieces, reminding me when or how she came to have them. She had a little of everything and these are some of my favorites. 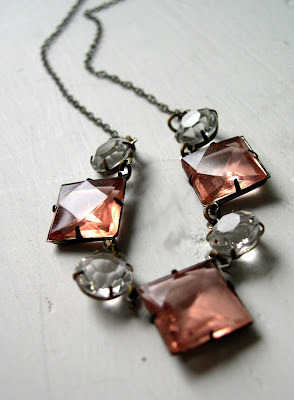 This little necklace is my favorite -- more faceted glass. I always admired it when she and I would look through her jewelry box. The note with this says "I'm glad you like this. I wore it as a young girl." 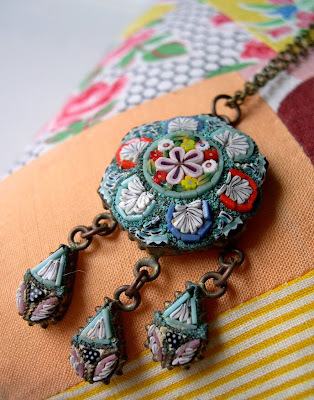 There wasn't a note with this Italian mosaic necklace. The tiny details on it are amazing. Two sweet pins. 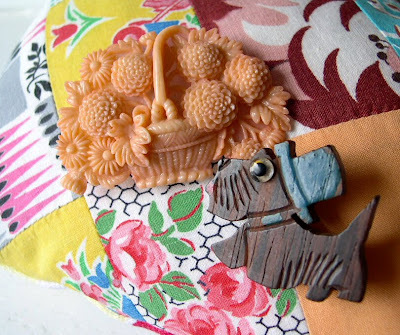 A pretty celluloid bouquet from Japan and a googly-eyed Scotty in a turquoise top hat. And this is the 'Mysterious Mary' pin. No note and no idea who Mary was. But I think I'll keep it in case the mystery is solved someday. 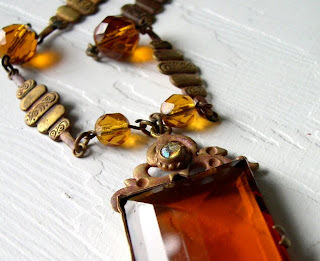 Beautiful, I love vintage jewelry..
How amazing to have a collection of your Mother's jewelry...and to have little notes with some too! What beautiful jewelry and lovely memories. Your mother was very thoughtful to leave the notes to pass along the history. Maybe Mary was a friend? Thank you for showing us these beautiful things. It was especially wonderful knowing that they are your family things. I don't know why but that makes me happy...knowing they aren't just orphans with no story. I am totally drooling. That faceted glass piece would not be safe around me at all ;) It's my favorite too! Those are really beautiful - especially that celluloid bouquet. Those pieces are so lovely, and I hope that you wear them! They must be so precious to you, almost as precious as the little notes that your mother wrote about each one! Those are so sweet. I think it's even sweeter that your mom wrote little notes for you about them. It's so sweetly sentimental - and I mean that in a good way. Thank you for sharing your precious jewelry with us. How pretty. Do you ever wear them? The necklaces would be gorgeous with a turtleneck. So nice to have special family heirlooms that you remember from your own childhood. Those are my fav, too. Wonderful!! I love that your Mom wrote the notes. Thanks for sharing. 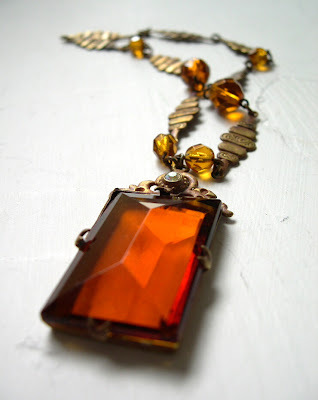 Oh, beautiful vintage heirlooms! That mosaic piece is just to die for...I love that you inherited these pieces. 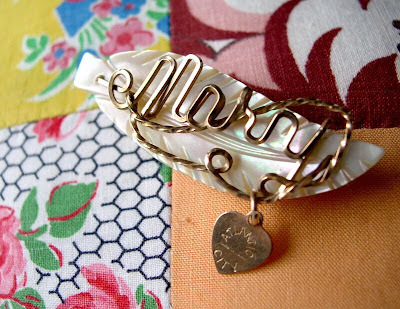 Such beautiful jewelry and I love how your mom left notes with it. P.S. Really like your blog. I now have you listed on mine as a favorite!